To start with I would like to apologise for the awful pictures. The weather is awful today and has been awful all week and I can't seem to take a good picture. I blame only the weather not my bad photo taking skills though! Oh and I have been very busy with afternoon tea. I am stitching over a couple of pages at the moment because I wanted to reach the gem and it was easier than stopping part way. I'm almost there. Lots and lots of black but I am just taking it bit by bit. Not doing much at the moment I have been doing the border. Oh and last but not least I have done some more of Jardin Prive - Sampler Aux Fleurs I do love this design and my pictures never do it justice. I have actually been working this week, I worked 4 days this week so I have made as much money as I used to in those 4 days as I was making in a month. I also thoroughly enjoyed my job, I had one class for three days while they were waiting for their contract teacher and I got a recommendation by the other teacher I worked with to the deputy so I made a good impression. I am thoroughly excited about this change in jobs I am much happier and less stressed though I seem to have less time for myself than I did the driving is much less! Anyway here is my wonderful update with very bad pictures! Boxers is beautiful! 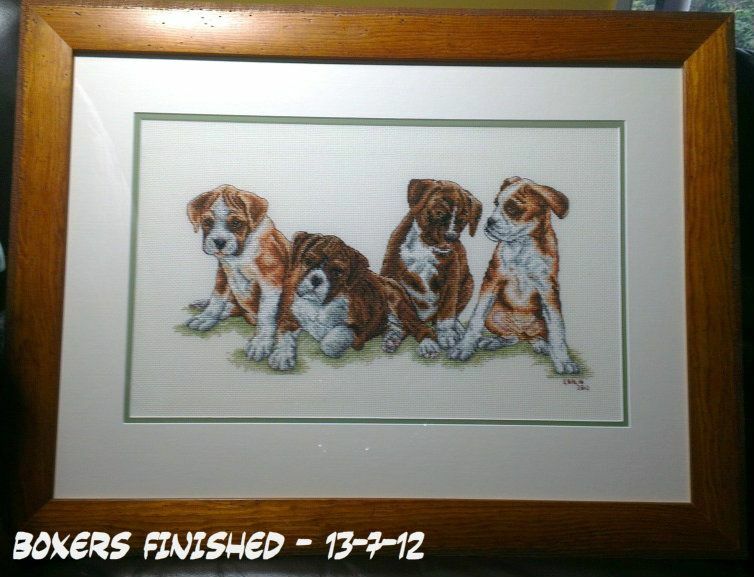 looks totally fab all framed up -well done on a great finish! So glad your enjoying your new job too. 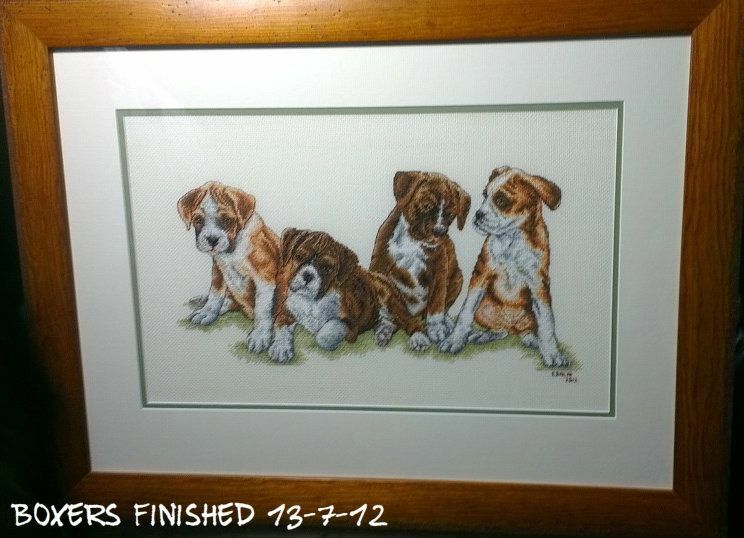 Boxers look fantastic framed up and your sampler looks great. I like your method of keeping your threads from tangling. Cool use of hair clips. Your wips are great, I especially love Afternoon Tea. Tell mum the boxers are fantastic, the framing is perfect. Your WIPs are lovely too. The Boxers are stunning framed. You must be so thrilled. Good progress on Afternoon Tea. 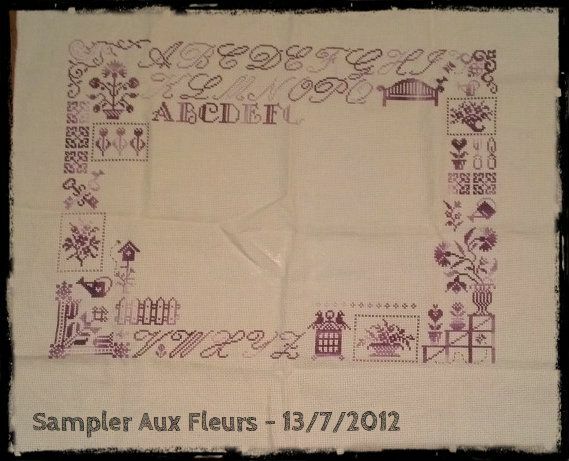 Sampler aux Fleurs is looking great too. Your WIPs show some nice progress. And the framed Boxer picture looks absloutely great. Boxers look great! 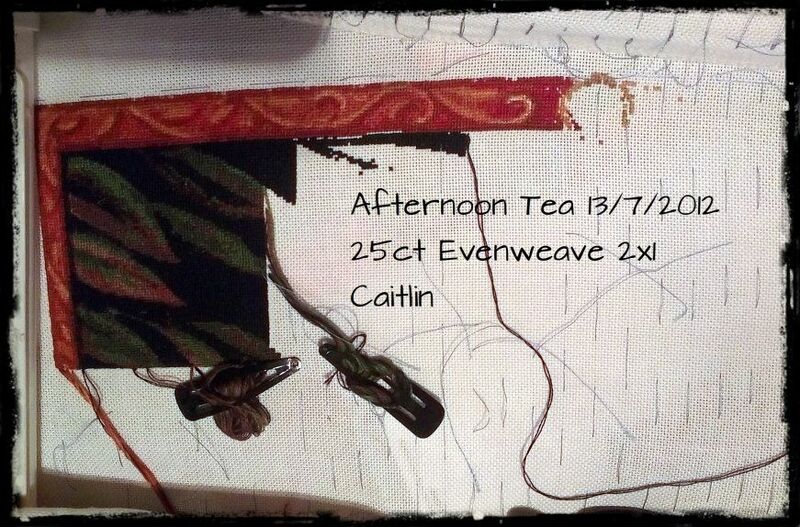 It's just amazing how big a difference a simple job change can make :) Also, your progress on Afternoon Tea is stunning! Love the Sampler Aux Fleurs and Boxers looks great all framed up. Congrats on your new job! How nice to make more money and drive less. More time for stitching!